Christmas brings joy and what joy is it to know that the popular Shelter in the Woods has finally reopened on the 12 November 2014. 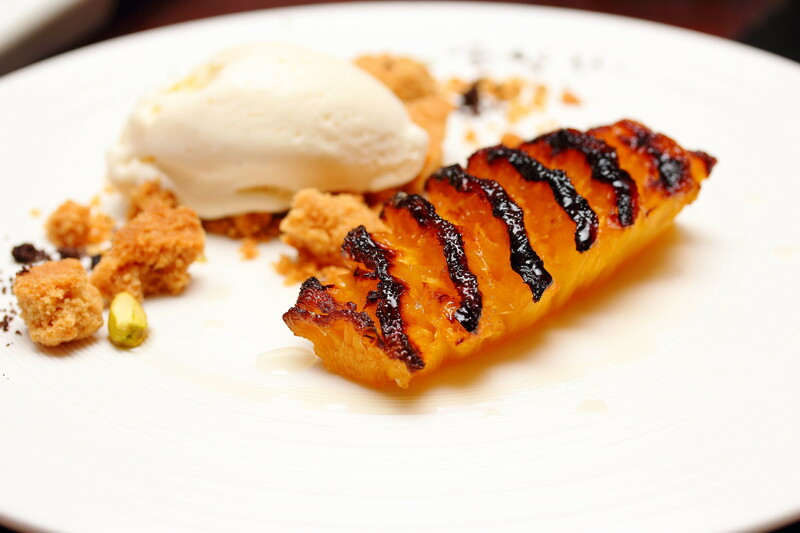 Besides offering the ever popular traditional rotisserie's dishes, the restaurant has up its game with the appointment of Consulting Chef Masashi Horiuchi who has more than 20 years of experience in Michelin restaurants across Europe, combining homely rusticity with finesse of execution. A great platter for sharing while waiting for the mains is the Shelter Charcuterie Board ($40). 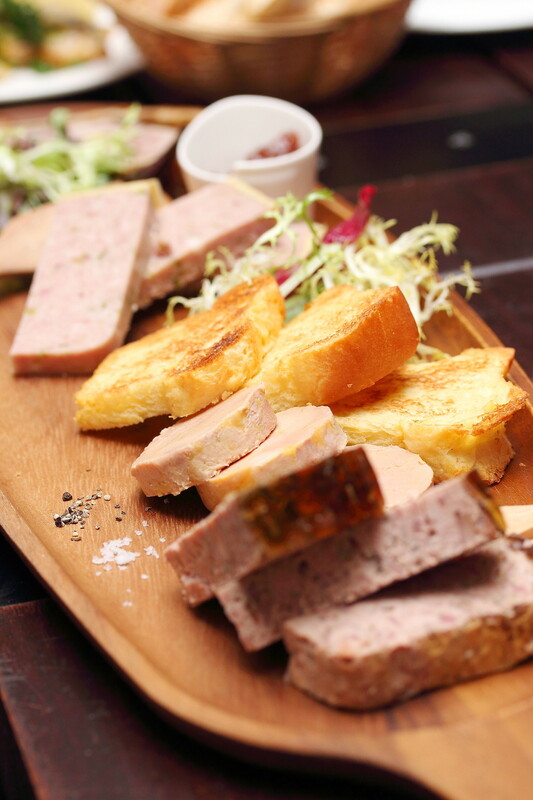 The charcuterie board features the BurgundyTerrine, Foie Grs Au Torchon, Pork Hat Terrine and Pate En Route. A ideal platter to kick start with some drinks. 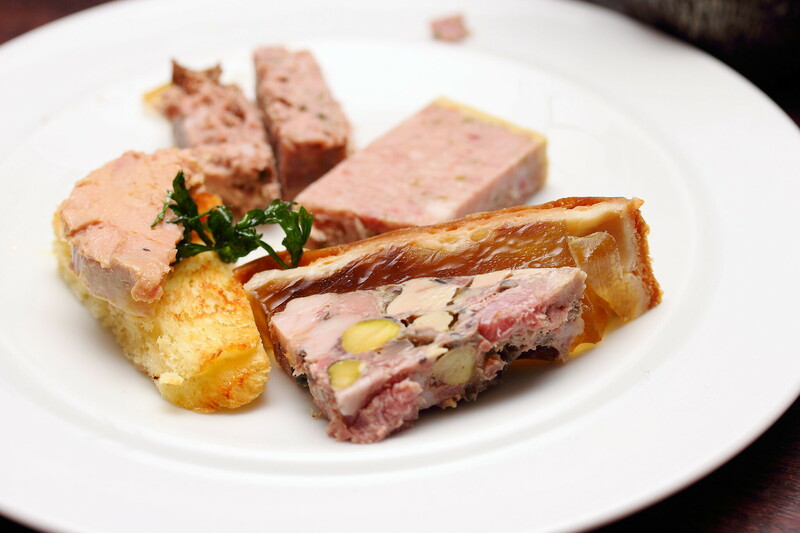 What really stood out on the Charcuterie Board is the Pate En Croute. This is really something new to me for the less travelled and shallow culinary knowledge. It is amazing how something that look quite ordinary which I thought was some sort of a pie can taste so beautiful. Slicing into the Pate En Croute revealed the different layers of duck foie gras, pork, veal, forest mushrooms, pig liver and consomme jelly wrapped in pastry. The harmony of all the ingredients took me by surprise with the consomme jelly and buttery pastry complementing it. 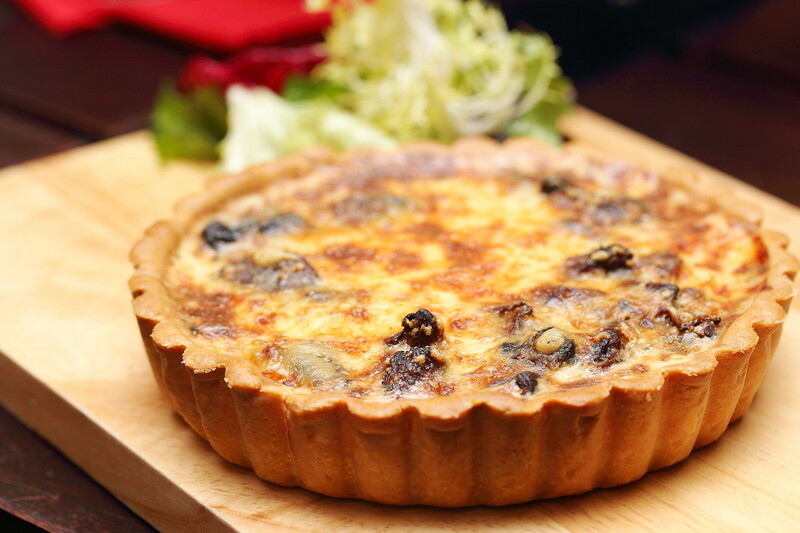 I have learnt that while quiche is a classic French dish, it actually originated in Germany. A signature at Shelter in the Woods is the Shelter Quiche ($12.50). 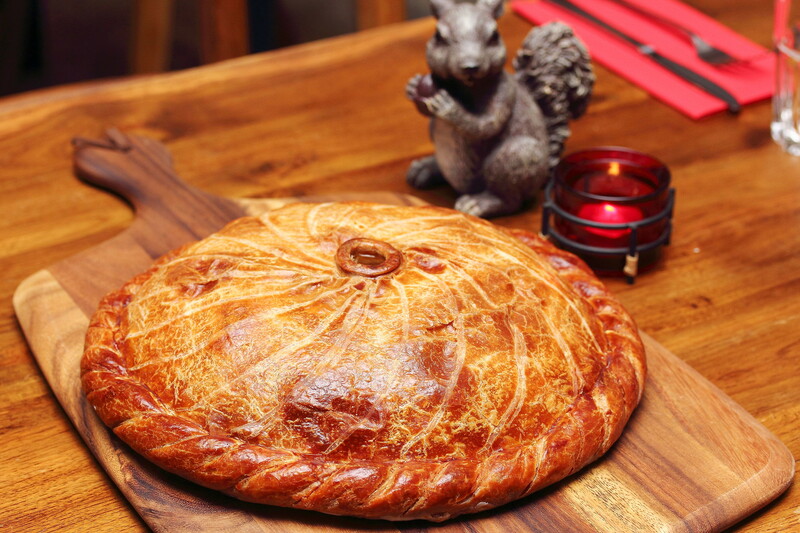 The short crust pastry is filled with forest mushrooms, Swiss gruyere cheese, garlic/herb butter, eggs and Swiss cream. I am not a big fan of quiche but this actually tasted quite yummy with the cheesy and earthy mushroom flavours. 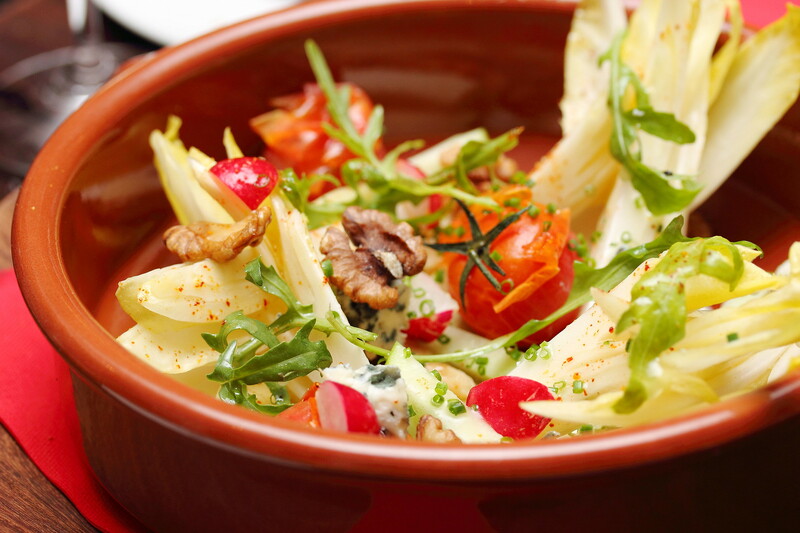 I thought the Endive & Roquefort Salad ($26) could be a bit acquire in taste for some. While the salad has a refreshing finishing with the used of green apple strips, cherry tomatoes and honey dressing, the Belgian endives were on the bitter side for me. I would prefer the traditional Lyonnaise Salad ($20) to the endive & roquefort salad. 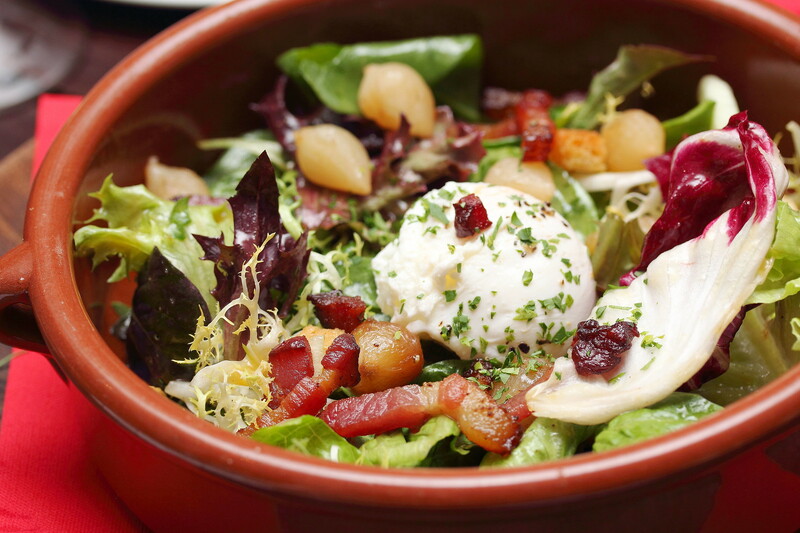 The savoury and tangy combination of Dutch smoked bacon and confit pearl onions dressed in a sherry vinaigrette provided the zest for the crunchy greens. The Creamy Corn Soup Trio ($12.50) showed a glimpse of the chef's finesse in execution. The Japanese corn and onions are boiled in water and then mixed with roasted corn, hence a hint of smokiness. Milk is added, blended and sleved. 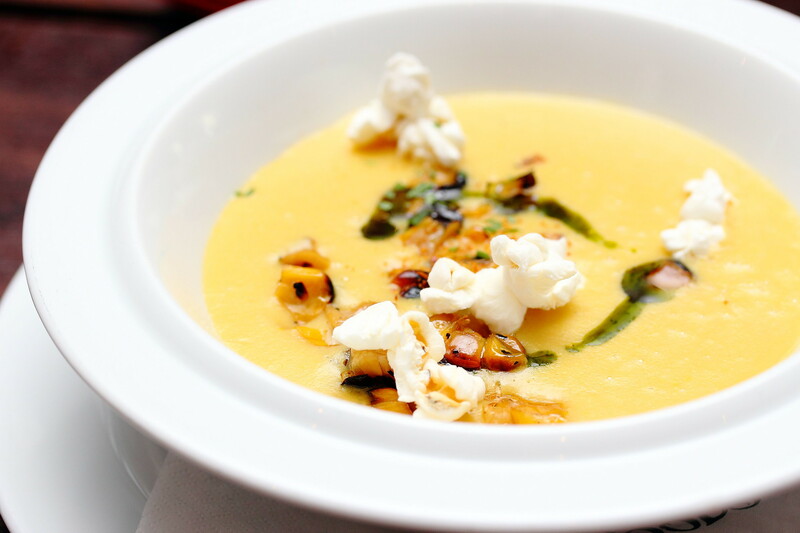 The soup is then garnished with roasted corn, pop corn and parsley oil. The detailed into a simple soup dish elevated the whole experience which used to be only know of its homely, rustic, tradition food. 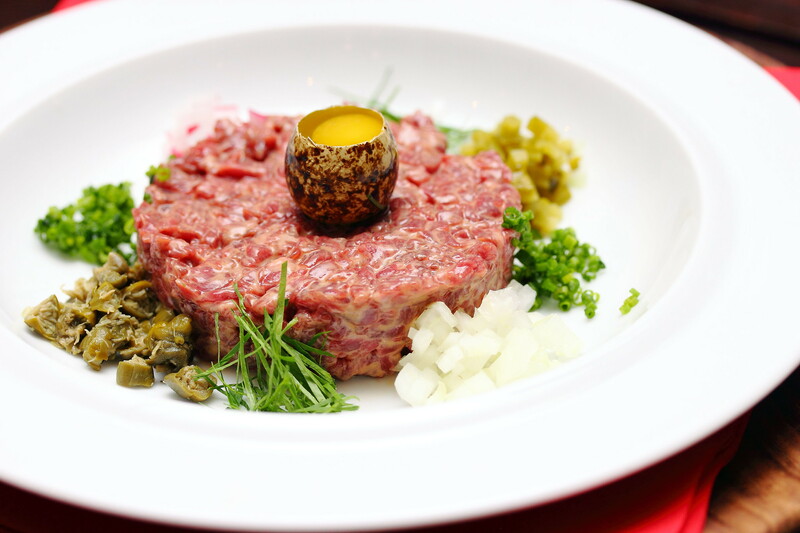 A great starter will be the DIY Steak Tartar ($18 for 100g). The Do It Yourself steak tartar of handcut Australian Black Angus beef comes with capers, cornichons, beet, onion, chives and served with toasted farm bread. Mixed them all together with the quail egg to bond all the flavours that burst into a blossom in the mouth. I was expecting a whole Rotisserie Suckling Pig ($35) such as those you get in a Spanish restaurant. Once again I was given a glimpse into his fine dining trained experience. The plating was beautiful. Cooked in the traditional flame rotisserie, the suckling pig is served with rotisserie pineapples, confit onions and gravy made of veal jus and caramelised onions. Perfectly executed, the skin was crackling while still retaining that juiciness. 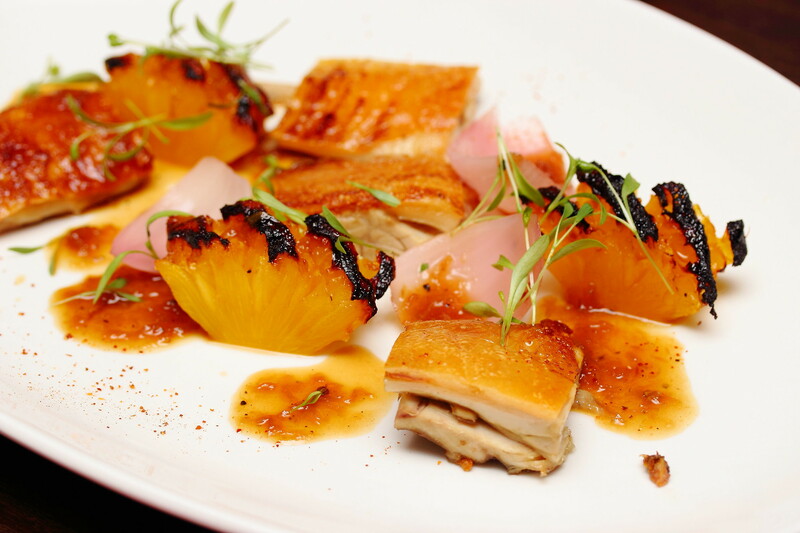 The used of pineapple also freshen up the palate from the natural greasiness of the meat. The Seafood Casserole ($35) is great for sharing. 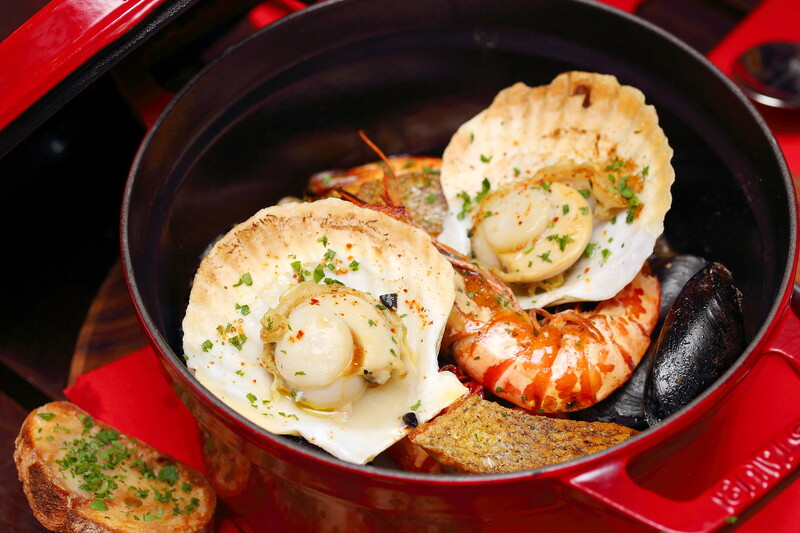 The luxurious pot of seafood features seasonal fish, prawns, mussels and clams. 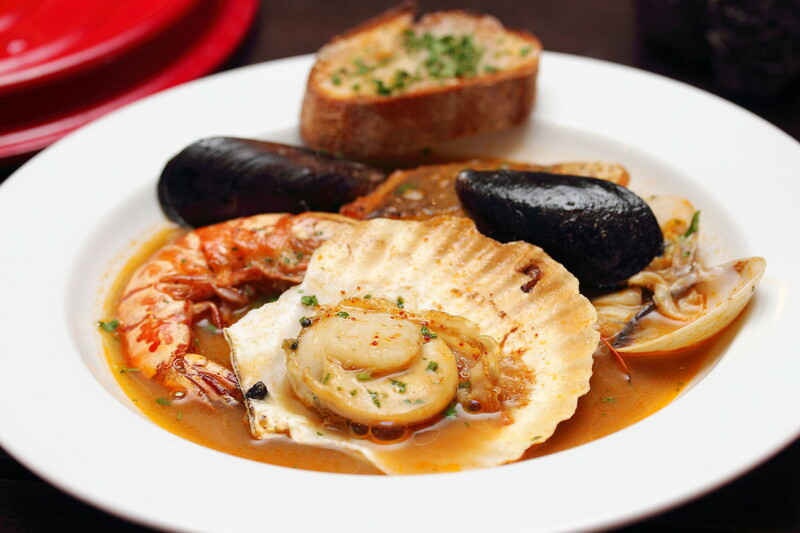 The highlight has to be the rich seafood broth made from fish soup, fish, prawns, lobster, fennel, leeks, celery. carrots, tomatoes and saffron. The hearty harvest from the sea will get all your senses singing in praise. 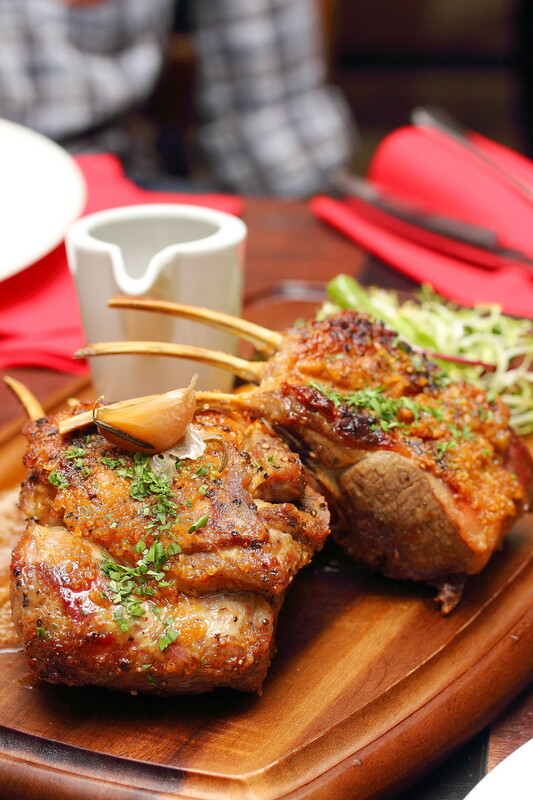 I love my lamb but the Rotisserie Rack of Lamb ($39) fell slight short of my expectation. While it was cooked to a nice tender and juicy in the traditional flame rotisserie and bathed in a garlic confit oil, the NZ rack of lamb somehow was lacking that gaminess which I enjoy tearing it off the bone. Being curator of the Ultimate Hawker Fest 2014 working with Tian Tian Chicken Rice and Toh Thye San Farm using the corn fed Anxin Chicken, I have known how good and sweet these chickens are. They are unlike the normally commercial boiler. I was quite excited to be reunited with Anxin chicken at Shelter in the Woods with the Roasted Chicken ($19 for half, $35 for whole). 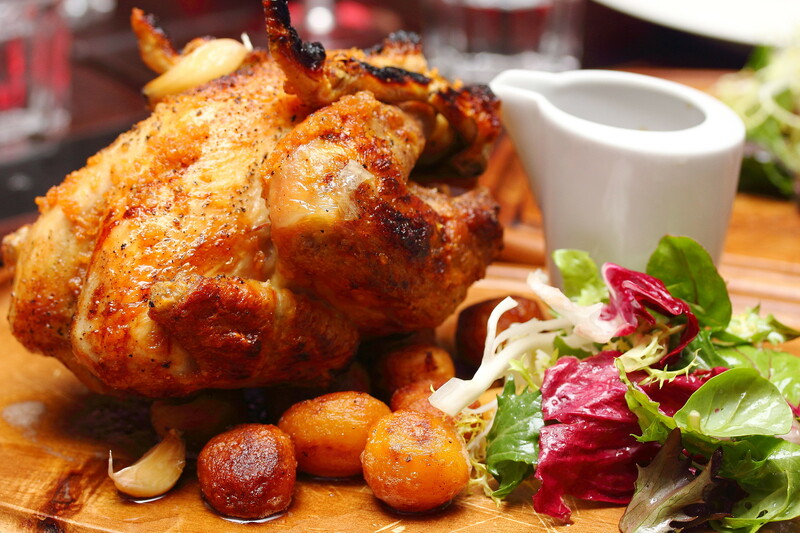 The rotisserie chicken is bathed in a garlic confit oil and served with roasted potatoes, mesclun salad and veal jus, caramelized onions gravy. I am glad that I can taste Anxin chicken again cause its sweetness is just so sweet on its own that you do not need any gravy or sauce. I like the idea of using the pineapples crumble for the suckling pig and I have enjoyed it. However, knowing that it is available in another dish less the ice cream and having tried it, I am not sure I will pay the money for the Rotisserie Pineapple Crumble ($14). Putting the taste aside, it is too simple for a dessert and probably would not get the satisfaction out of it. 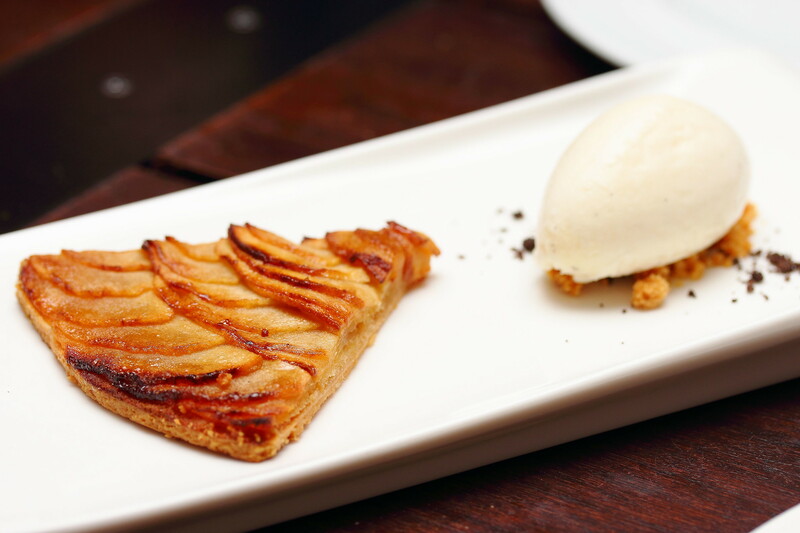 Having a warm sweet finish to a delicious feast is the Tiny Crispy Apple Tart ($12). The tart topped with Fuji apple, butter and brown sugar is thin and crispy. Paired with a scoop of their house made vanilla ice cream for a comfort finishing. 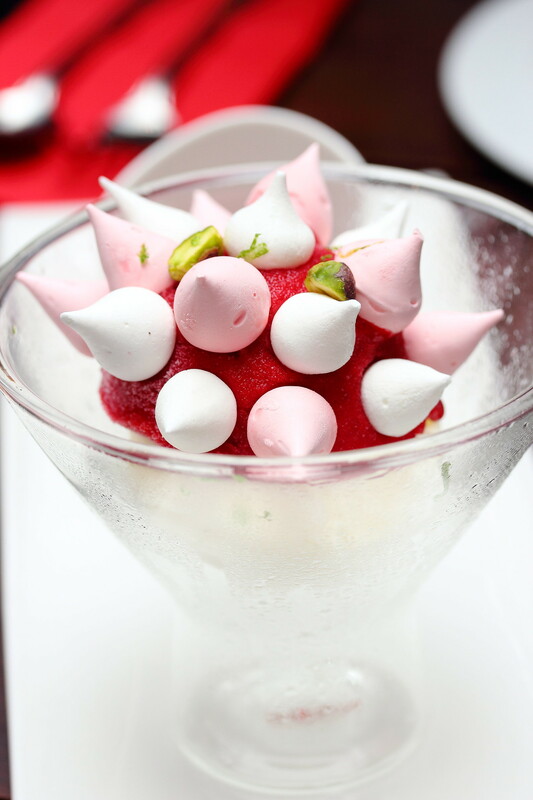 On a sweet note, there is the Meringue Glacee ($12) that come with a scoop each of the house made raspberry sorbet and vanilla ice cream, topped with baked meringue cones and pistachio. The re-opening of the Shelter in the Woods with its new chef and revamped menu definitely made a return with a louder bang. 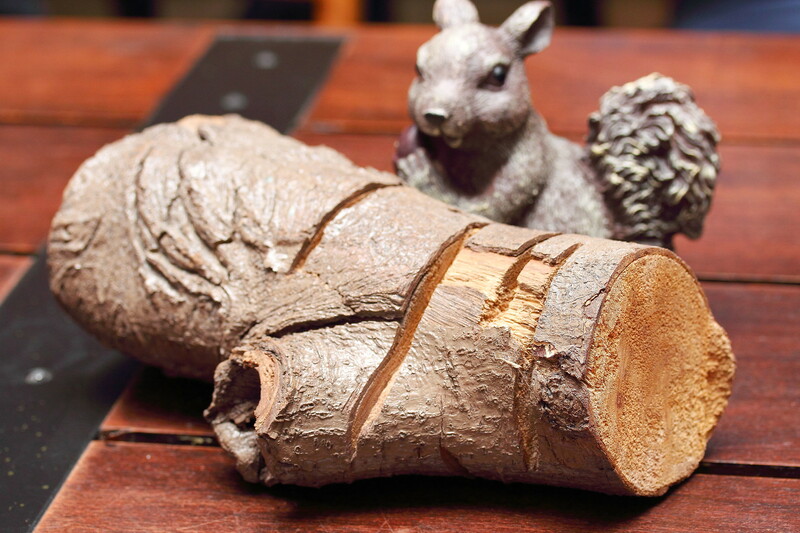 Combining the chef vast experience and rustic tradition, it has bring the restaurant to a new height. The extensive menu is really worth a visit or two and everything on it is worthy for recommendation. It definitely falls into one of favourite restaurants his year that I would want to return to check out the rest of the menu. I don't normally comment but this post was so badly written it distracted entirely from the food and your appraisal thereof. There is nothing wrong with simple English presented accurately (i.e., grammatically). Might I please suggest that the author refrain from unnecessarily complicated or pretentious turns of phrase (e.g. "homely rusticity with finesse of execution") and focus instead on landing the basics. I'm sure that will prove more fruitful by far in achieving what I assume to be the point of this post - a coherent communication of the merits of the restaurant. Merry Xmas. Merry Xmas and thanks for your feedback. I admit I am not good in my writing but this will not stop me persisting with my passion in food blogging. I will fall but I will also learn along this journey.